Home > About Us > News > Thank you! As 2018 draws to a close and we think about our achievements, it becomes clear that we owe a big thank you to every single person who has supported Turn2us this year. Of course, Turn2us simply could not operate without such incredible support. In 2018, Turn2us had the support of 239 incredible volunteers – it would require four buses to collect them all! Picture that alongside the one bus it would require to collect Turn2us staff and it begins to become clear how crucial volunteers are to the organisation. Those same four busloads of extraordinary people volunteered for a collective 1,900 hours. That’s 79 continuous days, without sleep! Those hours don’t even include the incredible efforts of all those who have competed in events and raised unbelievable sums for the charity. We’ve had people running, climbing, swimming, crawling, walking, baking – all in the name of helping people when times get tough. 2018 Turn2us runners alone covered enough distance to get from London to Barcelona – over 1,100 km! (Much of this at Tough Mudder: a course with 40 tons of ice; 500,000 litres of mud and 10,000 volts of electricity – thanks again Monzo!). 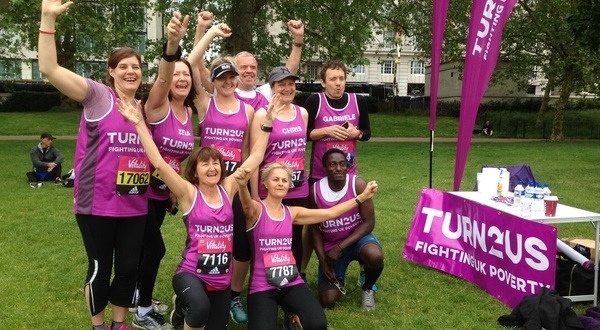 We’ve many more miles in the diary for next year too – the very same incredible ladies who ran the Toulouse Marathon are set to run the London Marathon in 2019. Perhaps next year we might be able to make it from London to Cairo! In the financial year (17/18), donations, grants and legacies raised a spectacular £2,116,000. A sum like this is only possible through thousands of donations. That's only the side of things we can measure. Who can even begin to suggest the effects - big or small - of having Turn2us be a part of this many incredible supporters' lives? Arguably, this has the biggest effect of all. Having events like the London Marathon or the Great North Run dotted with Turn2us pink and purple; having volunteers talk casually about their role in Turn2us; having people sharing Turn2us content – it all adds up. The online tools are being used more than ever; more and more people are finding out what financial help is out there and how they can get the support available to them. So, as 2018 draws to a close, there really is only one thing we can say. To every single one of you who supported us in any way at all: Thank you. Previous Get active in your community!